Water is as vital to fish as air is to us, but fish kept in an aquarium are in an enclosed environment, so are entirely reliant on you to provide them with the water conditions they need. Fish have varying water requirements: some need acidic water, others neutral or alkaline water. Unfortunately, you cannot tell just by looking at water whether it is suitable for your fish. The chemical constituents present in tap water vary, depending on its source. Water that has filtered down through chalk, for example, before going into the supply system, has a different chemistry from that of rain water that has fallen into a pond. There are two principal aspects of water chemistry that are important in an aquarium – the pH value (how acid or alkaline it is) and its degree of hardness. Water may be acidic, neutral, or alkaline, and this is measured in terms of its pH. Water is defined chemically as H20, which indicates that it is composed of hydroxyl (OH) and hydrogen ions (H). The pH reading reflects the relative proportions of these ions. Where hydrogen ions predominate, the water is acidic, whereas an excess of hydroxyl ions results in alkaline water. At pH7 (neutral), the hydrogen and hydroxyl ions are evenly balanced. As this figure decreases, the water becomes more acidic, whereas if it rises, the water sample turns increasingly alkaline. The pH scale is logarithmic, which means that a change of just one unit actually reflects a tenfold alteration in the concentration of the ions. For fish, this would be a dramatic shift. Most species live within a pH range of 5-9.5, with the specific figure remaining relatively constant under normal circumstances. Water chemistry influences the fish’s own internal body chemistry, which can adapt, partly owing to a hormone in the blood and the gill membranes. If the pH of the fish’s blood starts to fall, bicarbonate ions are used to maintain the correct level. Conversely, if it starts to rise, then these ions are removed from the fish’s circulation. If the change is too great for the fish to adjust, however, then they will start to sicken; this is why it is so important to monitor the pH of the aquarium water regularly. You can do this quite easily with a test kit or a pH meter, which has a probe that you dip into the water sample to test it. If you need to make an adjustment to the pH of the water, do it gradually, so that the fish are not subjected to dramatic changes in their environment. To maintain alkaline conditions, you can add calciferous material to the tank; its impact will decline over time so you will need to replace it periodically. Water naturally contains substances that act as buffers, helping to prevent an increase in acidity, but you can also buy buffering agents for this purpose. Using a substrate that contains limestone is suitable where alkaline water is required. 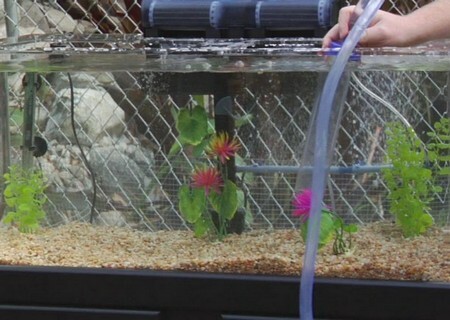 Where more acidic conditions are required, the simplest method is to add aquarium peat to the filter, if you are using a canister-type flow unit rather than an undergravel system. For maximum effect, you should replace this peat regularly – probably every three weeks or so. It will be easier to achieve the desired effect where the water is naturally soft, since this the relatively high levels of dissolved bicarbonate and similar chemicals that have a buffering effect. Maintaining the desired acidic pH level in hard water is more difficult and you will need to take additional steps, simply because there is a much greater risk of fluctuations under these conditions. Adequate aeration of the water is especially important, to remove carbon dioxide, which would otherwise cause the pH to fall too low. Partial water changes are also vital; these will help to counter the excess increase in acidity which results from biological filtration, caused by the production of nitric acid. Changing a proportion of the water regularly is a crucial part of basic aquarium maintenance, helping to keep the water clean and remove some of the fish’s waste without disturbing the fish. Water changes help to dilute the level of acidity, preventing the pH from falling too low. The volume of water removed depends on the individual tank, but as a guide, you should aim to replace 20-25 percent of the water, every three or four weeks. Check the pH afterwards to determine the effect of the water change and adjust the volume accordingly if necessary in the future. Similarly, regular monitoring will help you decide when to carry out the change. Water that is excessively acidic will adversely affect the functioning of a biological filter, since the aerobic bacteria that populate it prefer a neutral pH. If this figure falls below pH6, their level of activity will be seriously compromised. This, in turn, could have a serious effect on the overall water quality, which must be addressed quickly or the fish will suffer. As well as partial water changes, adding zeolite sachets to a canister filter will lessen reliance on biological filtration, because this compound removes ammonia directly, by chemical means. 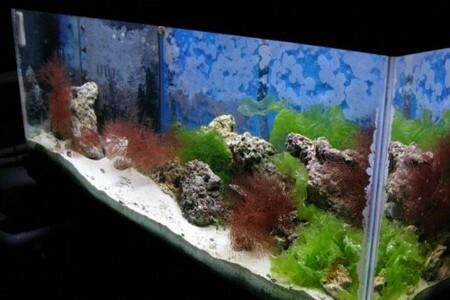 In an acidic, soft water aquarium, it is preferable to use a filter of this type, rather than a simple power filter that depends almost entirely on biological activity. Although you should avoid most problems with shifts in pH by good preparation followed by regular maintenance and monitoring of the water, you should also stay alert for warning signs in the fish themselves. For example, if fish are suddenly transferred to unsuitable water conditions, then they usually become hyperexcitable, swimming around wildly and displaying difficulty in breathing. If the cause of the problem is not detected, they will die soon afterwards. Where there is a more prolonged build-up of acidity, then you may notice excess mucus on the sides of the fish’s body, with the skin assuming a reddish tone, although this is sometimes indicative of bacterial infection. Similar behavioural signs occur in excessively alkaline conditions. Fish suffer alkalosis, with erosion of the fins and increased difficulty in breathing.